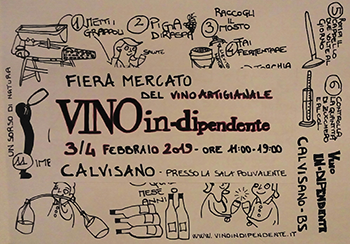 Vino in-dipendente is a trade fair that deals with wines. It takes place from Sunday 3rd to Monday 4th February at the Sala Polivalente of Calvisano (Brescia). Visitors can taste wines made from more than sixty different wine growers. To be elegible for degustations, visitors can buy a glass at the price of 10 euros. Opening hours: Sunday from 11 am to 7 pm, Monday from 11 am to 6 pm.